Due to the overwhelming popularity of our Robert Pattinson cartoon, and the huge number of requests from Twilight fans to cartoonize the other Twilight cast members, we have decided to do one Twilight character every week. Next to Edward Cullen, is of course, the apple of his eye. Most of us know Kristen Stewart as the beautiful girl who played Bella Swan in the movie adaptation to Twilight. Before being Bella though, Kristen also appeared in different movies such as Panic Room, Zathura, and Into The Wild. It is also good to note that she will once again be playing the role of Bella Swan in New Moon, the next movie in the Twilight series. No matter how dazzling she is, she cannot escape Cartoonize The World. 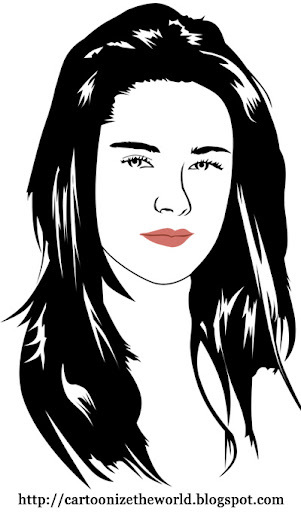 Bella Swan, you've been cartoonized. BUT WAIT. The excitement doesn't stop there. As a tribute to everyone who have been supporting our efforts to cartoonize the world, we are giving away something special this week. Come wednesday, instead of posting a cartoon, we will be sending through e-mail, a copy of the following image in 720p, and without the annoying watermark (and no more black lips for Rob). 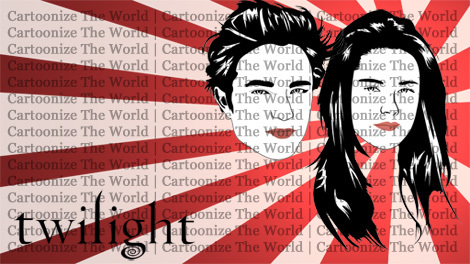 This is an excellent wallpaper for all you Twilight fans and Cartoonize The World supporters out there! ANDDD. Watch out for our next SURPRISE to all our beloved readers. Want a clue? Awesome! Thanks alot for responding to the comments by drawing more Twilight cartoons! he' really hilarious, can you cartoonize him pleeeeeeaaseee?!?!?? srry but they kinda look asian!?! *Really good work! This is soo cool! Cant wait for the other cartoons! I think it will be Jacob Black! Cartoon more like hoodoo that does not look like them people!!!!!!!!!!!!!!! I like what you did with EDWARD CULLEN--------- wait for it no I LOVE it (edward cullen) you could do a vampire one of ♥EDWARD CULLEN♥ !!!!!!!!!!!!!!!!!!!!!!! !